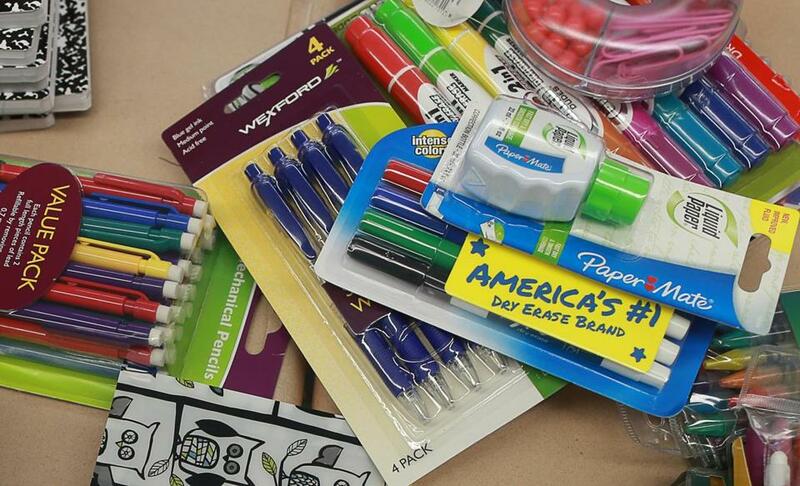 Some teachers are turning to crowdfunding so they can buy students school supplies. With school budgets running tight, Tom Shull turns to the Internet to raise money for all sorts of supplies for his students at Quincy Upper School in Boston: books, pencils, highlighters, post-it notes, toner cartridges. In all, the speech therapist has posted four dozen funding requests over the last five years on DonorsChoose.org, raising more than $25,000 for his high school students. The requests sometimes go beyond the typical. When he and his colleagues started a running club for students with disabilities, he sought help to buy sneakers for those who couldn’t afford them. More and more, teachers across Massachusetts are embracing crowdfunding to cover everything from basic supplies to pricey technology. The boom builds upon what teachers have been doing for years: digging deep into their own pockets to stock their classrooms with items that were once covered by school budgets. And crowdfunding is increasingly becoming an attractive revenue generator for schools. On DonorsChoose.org, for instance, annual donations to Massachusetts schools have grown from $81,000 in 2007 to $2.4 million last year. A review of the crowdfunding requests offers a glimpse into the state of funding for classroom supplies, furniture, and computers. In Haverhill, an elementary school librarian raised $313 this year to stock her shelves with dozens of biographies on Harriet Tubman and other historical figures. In Worcester, a middle school teacher secured $582 for bookshelves. And in Chelsea, a middle school teacher is seeking $398 to buy 60 headsets so her students can practice language skills. The requests also provide a window into some of the novel teaching approaches taking place, such as an Ashland High School teacher who snagged $610 to buy three robots for an engineering class. Sandra Rodgers turned to GoFundMe.com for the first time this summer after being hired as a teacher at the Guilmette Middle School in Lawrence and quickly raised $400 for classroom supplies. Nationwide, teachers spend on average $487 a year of their own money on supplies, according to Agile Education Marketing, an education information firm based in Denver. That’s because school systems have only a limited amount of money to spend on supplies, technology, and other materials. Districts often distribute funding for supplies to schools on a per-student basis, but the allotted amount often falls victim to other budget needs because it represents one of the few areas of discretionary spending. State data indicate that budgeting for school materials remains inconsistent. Over the last five years, the average amount Massachusetts school systems spent per student each year on instructional materials, equipment, and technology has fluctuated between $431 and $377 per student. That’s a tiny percentage of the overall expenditures per student, which reached a state average of $14,936 for the 2014-15 school year, according to the most recent data. In Boston — where years of tight budgets and increasing costs led to protests by students, parents, and schools this year — teachers are increasingly feeling the financial pinch. More than 90 percent of the city’s public schools have posted at least one request on DonorsChoose.org in recent years for everything from pencils to computer tablets. Daniel O’Brien, a Boston Public Schools spokesman, said the system is grateful for the donations that have come in. “Crowdfunding can highlight the positive work happening in our schools,” he said. But Richard Stutman, president of the Boston Teachers Union, said it was unfortunate that teachers have to ask strangers for money to buy basic supplies. “I am embarrassed for our profession and our school district that people have to resort to these tactics,” Stutman said. Although the state’s conflict-of-interest law restricts the dollar value of personal gifts for public employees, such as educators, it places no financial limits on gifts for school use. But the Massachusetts Association of School Committees recommends that districts create policies for such donations, such as keeping receipts for purchases made with gift cards or cash. Crowdfunding is rather easy, several teachers said, although the process can vary widely among the sites. GoFundMe.com lets teachers withdraw money directly from accounts, while DonorsChoose.org vets a proposal before posting it and then purchases the items for a teacher. Proposals typically get funded within a month from donors, who often have ties to a school or community or are interested in a particular subject matter. Sandie Eltringham, who works as a consultant in pharmaceutical and biotech fields, looks to fund projects for math and science classes. But she also gives to projects outside those areas if her donation is the last one needed to make it a reality. Since 2007, the Boston resident has made 36 donations. “There’s definitely a sense every little helps,” she said. Sean Ingle, a social studies teacher at Conservatory Lab Charter School in Dorchester who is crowdfunding for 15 laptops, said it is awkward asking strangers for money but added that crowdfunding can provide his seventh- and eighth-graders a powerful lesson in civic engagement.